For the next month, this will be a familiar scene on the Seahawks sideline. 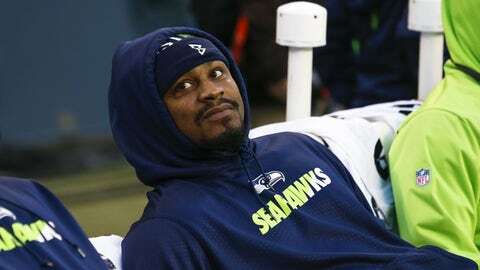 Seattle Seahawks running back Marshawn Lynch is expected to miss three to four weeks after undergoing surgery for an abdominal injury, Pete Carroll said on Wednesday. Lynch was in Philadelphia earlier in the day to visit Dr. William Meyers, a core-muscle specialist who performs surgeries to correct most of the sports-hernia injuries suffered by NFL players. The Seahawks initially believed Lynch’s injury was not a sports hernia and wouldn’t require surgery, though that changed when Lynch missed this past Sunday’s game against the San Francisco 49ers because of increased discomfort in his low abdomen/high groin area. The team hopes Lynch, who missed two games earlier this year with a hamstring injury, will be back for the tail end of the regular season and be ready to go for the playoffs. In the meantime, undrafted rookie Thomas Rawls will continue to carry the load for a team that moved on from veterans Christine Michael and Robert Turbin because they liked what they saw in Rawls. So far this season, Rawls has 604 yards on 101 carries and three total touchdowns. Last weekend against San Francisco, Rawls ran for 209 yards and a touchdown on 30 carries, and added another 46 yards and a score on three receptions. To put that into perspective, Lynch’s regular-season career-high in rushing yards is 153 — in his 2007 rookie season with Buffalo — and he has had at least 30 carries just once (32 vs. Baltimore in 2013). Lynch had 157 yards on 25 carries against the Packers in last season’s NFC Championship Game. The Seahawks sit at 5-5, three games behind Arizona in the NFC West but only one game behind Atlanta in the wild-card chase. Among the Seahawks’ remaining games are a Week 13 tilt at Minnesota, which currently holds the first wild-card slot, and a season finale at Arizona. Three of Seattle’s other four remaining opponents have losing records: Baltimore, Cleveland and St. Louis. The Seahawks host Pittsburgh this coming Sunday.